The TTS Software Updater is used to install and update all other TTS applications, calibrations, and documentation. Get the newest versions of all TTS software. 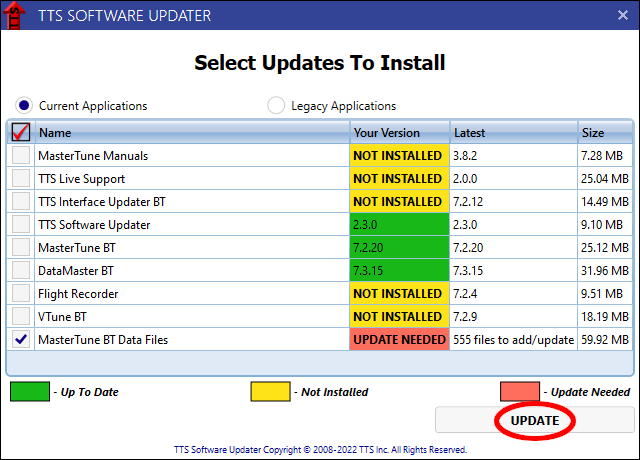 Download and run the TTS Software Updater setup program by clicking the link above labeled "TTS Software Updater." If you don't know how to download and run a program, click this link for instructions: How to download and run a program. Installing TTS software requires administrative priviliges. 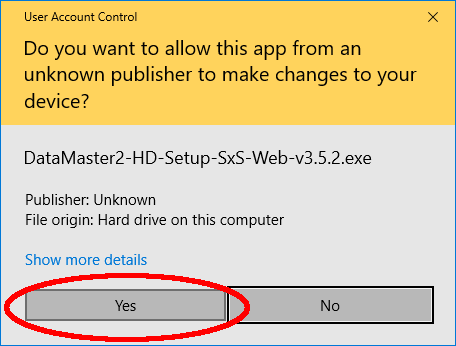 Windows will prompt you for permission to run the installer. If you are not logged into your computer as an administrator, Windows will also ask you to enter the administrator password. Enter the administrator password if required, and click Yes to install the TTS Software Updater. Windows UAC prompt. Click 'Yes'. Windows UAC prompt. Enter the admininstrator password and click 'Yes'. To install the software you must accept the copyright and license agreement. 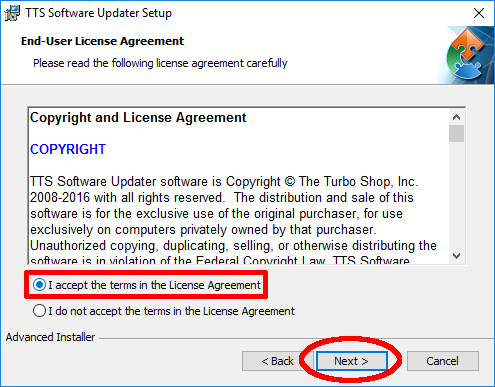 Click on "I accept the terms in the License Agreement" and then click the "Next" button. License Agreement. Select 'I accept' and click 'Next'. The installer will display some other information and options. You can accept accept the defaults by clicking the "Next" button on each screen. On the 'Ready to Install' screen, click "Install" to start the installation. Click 'Install' to install program. It is recommended that all TTS applications be kept up-to-date. The TTS programs work together, and for that reason MasterTune, VTune and DataMaster should all be the latest versions. The TTS Software Updater is used to download and install the newest versions of all TTS software and calibrations. NOTE: TTS applications must be updated by a user with full administrative privileges or the update will fail. Windows will request administrator credentials if necessary. The TTS Software Updater does not run automatically. It is recommended that you run the Software Updater occasionally to check for new versions of TTS applications and calibrations. The TTS Software Updater program is run using the icon on the desktop, or the entry in the Start menu. Programs with a yellow background are not installed. Programs with a green background are installed and up-to-date. Programs with a red background are installed and there is a new version available. 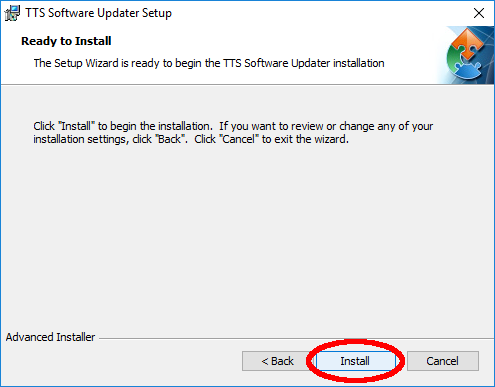 Programs are installed or updated by selecting the ones you want (click to put a checkmark in the check box), and then clicking the "Update" button to download the run the installers for the selected programs. If you are using the Software Updater to install TTS applications for the first time, everything will be yellow except for the TTS Software Updater. Select all programs that you want to install and click the "Apply Selected Updates" button. The Software Updater will download all selected programs before it starts installing them. After all downloads are complete, the Software Updater will run the installer for each application in sequence. 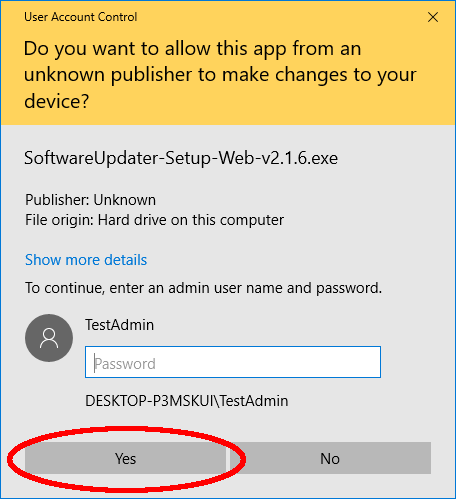 For each application that is being installed or updated, you will have to tell Windows that it's permitted to run, and click through its installer wizard. 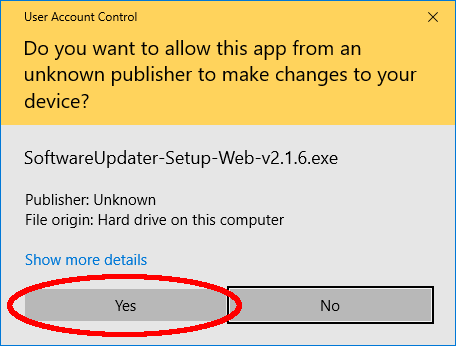 NOTE: If you do not click 'Yes' on the Windows UAC prompt within a couple minutes, Windows will assume that the program does not have your permission to install, and the install or update will be canceled. When one install or update fails in this way, the Software Updater will cancel all subsequent installs/updates as well, so you will have to start the whole process over again from the beginning. We recommend that you do not leave the updater unattended, so that you can respond to the Windows UAC prompt reasonably quickly. 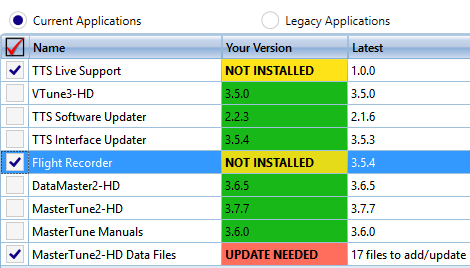 After all applications have finished installing, the Software Updater will return to the list of available updates. If you have just installed MasterTune for the first time, the Software Updater will now show that there are Data Files (Calibrations) available for download. 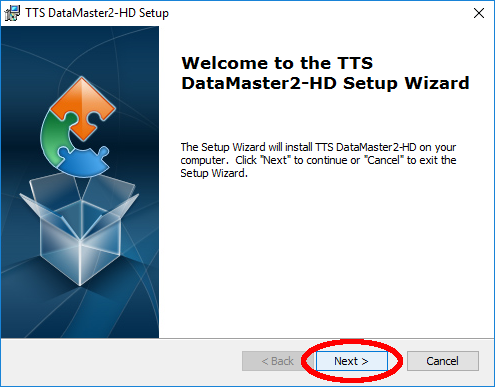 Make sure that there is a check mark next to "MasterTune2-HD Data Files", and click "Update" to download the calibrations. The data files will now be downloaded. NOTICE: MasterTune calibration files are now installed to the My Documents\TTS\HD\Calibrations folder. The TTS Software Updater will not alter any existing files on the PC, it will only copy any missing or new calibrations to the My Documents\TTS\HD\Calibrations folder. When all applications and data files are updated, every row in the Software Updater will be highlighted green (or yellow if you chose not to install some programs.) You are now ready to start tuning!